Nakoda (Hindi: नाकोडा तीर्थ) is a village in the Barmer District of Indian state of Rajasthan. The village name is Mewanagar in the Rajasthan state Government records. This village was known by the names of Nagara, Viramapura and Maheva at different times in the history. 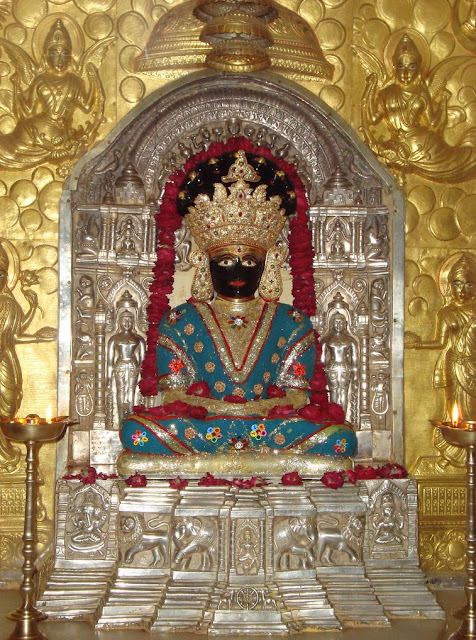 When Nakoda Parsvanatha Jain temple was made this village gained popularity by the name of Nakoda. Nakoda is a holy place of the Jains. 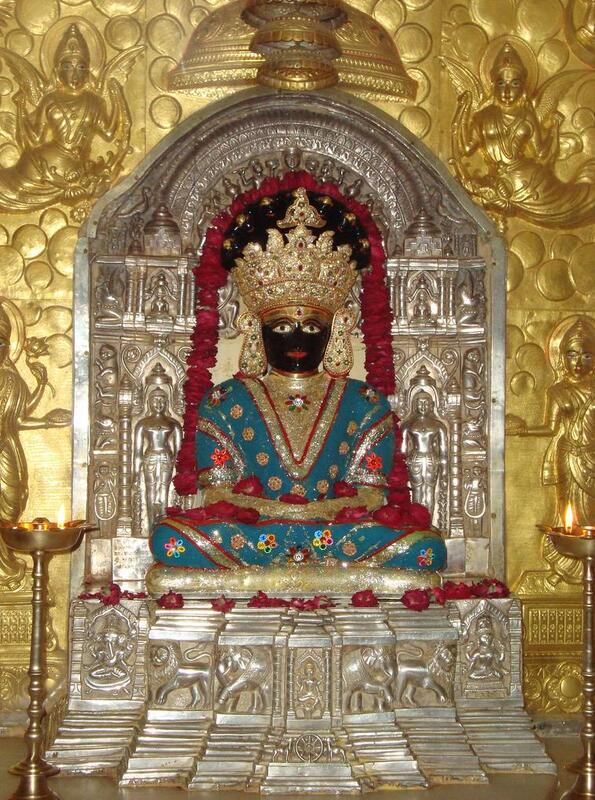 Mulnayak is a nearly 58 cm high black-colored idol of Lord Parshwanath in the Padmasana posture. Today Nakodaji is world wide famous for miracles at Nakodaji..
Nakoda pilgrimage is a center of worship for the masses due to its miraculous peril-preventing power. On remembering Nakoda, the Lord makes the path of life hurdle-free and paved. The common masses maintain that the 'Prasad' (offerings in the form of sweets, fruits etc. )dedicated here should be distributed within the precincts of the pilgrimage. Taking the 'Prasad' elsewhere from the parameter of the pilgrimage is not considered to be proper. Pilgrims start offering oil on the idol of Shri Bhairavji from 11.30 in the morning, which is available at Modi khana near the pedhi. The dadawadi of dada guru Jinkushal suriji is built-up on a small hill near the temple. Pilgrims offers their homage to him by taking darshan of his pagaliyas of dada guru. The look of temple from the top of the hill is very interesting. Hundreds-thousands of travellers come here daily from every corner of India and maintain partnership in the name of Bhairav even in their business. This is indicative of a unique faith towards Bhairavdev. A big fair is held here on Poush Krishna Dashami, which is the birthday of Lord Parshwanath. 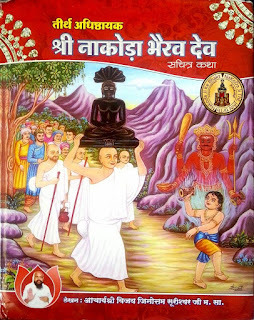 This teerth place was established by Parampujya Shri Sthulibhadra swamiji, and hence it has much importance in Jainism. 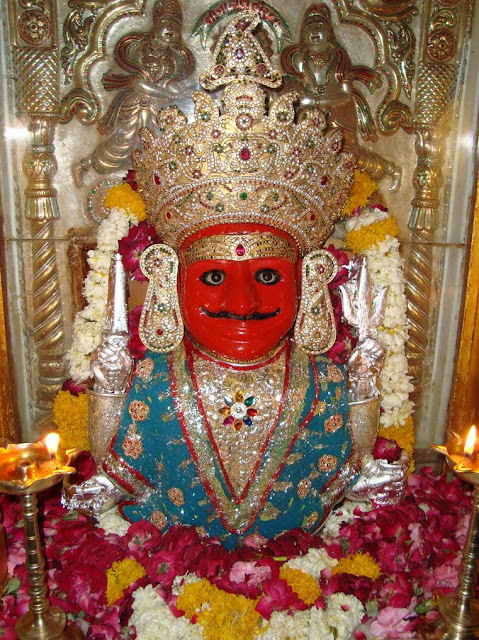 The ancient idol of Shri Parshwanath Bhagwan is very attractive and full of magical powers. Shri Bhairavji Maharaj, the adhisthayak dev of this teerth place is magically very powerfull and is famous in the world for the amazing miracles. Even if there is no house in his area but it seems like a small city by the flow of pilgrims and visitors who keep on coming here for fulfillment of their wishes. The ancient name of this Tirth is mentioned as Virampur. Virsen and Nakorsen of the third century of the Vikram era built this temple and His Holiness Jain Acharya Sthulibhadrasuri installed the idol. In course of time, this temple was renovated many times. When Alamshsh invaded this place in the year 1280 of the Vikram era (1224 AD), the Jain Sangha kept this idol hidden in the cellar in the Kalidrah village for protection. This temple was again renovated in the fifteenth century. 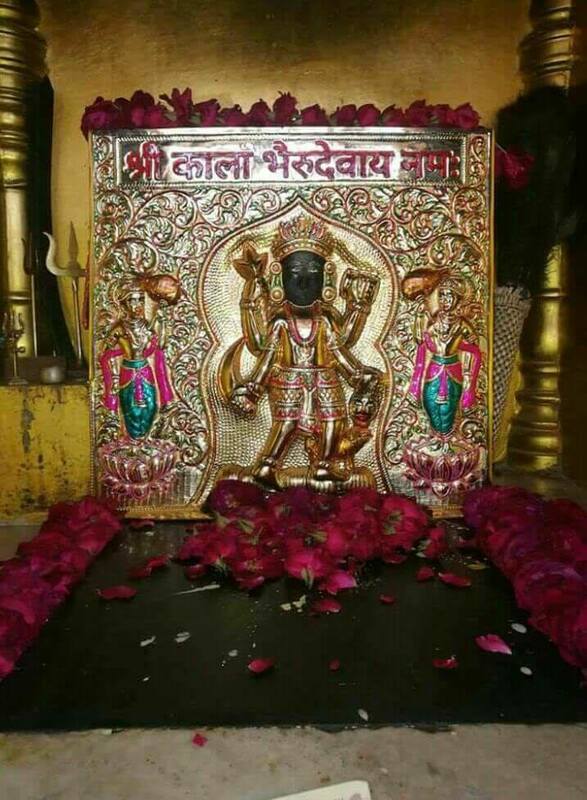 120 idols were brought here from Kalidrah and this beautiful and miraculous idol was installed here as Mulnayak (main idol of the temple) in the year 1429 of the Vikram era (1373 AD). Jain Acharya Kirtiratnasuri installed the idol Bhairav here. 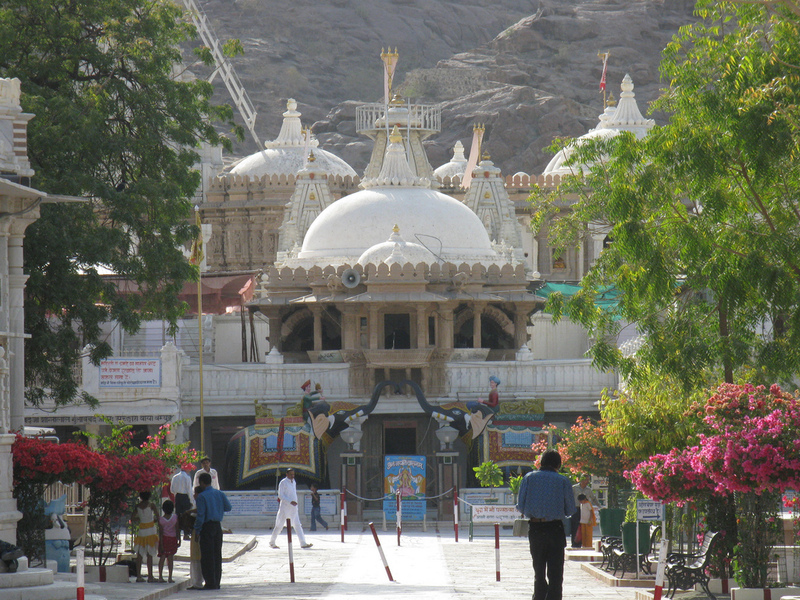 Apart from Nakoda Parsvanatha the other Jain temples here are dedicated to Rishabhadeva and Shantinath. The Parsvanatha Jain temple was originally a temple of Mahavira. One of the Founding Trustees of the current temple at the Nakoda Tirthstan is the late Shri Keshrimal Sanghvi of the now defunct Patent Tiffin Carrier (PTC) company from Pune. The current generation of the Sanghvi Family still remain as one of the Trustees of the temple. There is a idol and exclusive temple of Kaala Bheruji outside the Tirth. It is among the hills in the distant forest at a distance of 13 kilometers from Balotra. The nearest railway station on Jodhpur-Samadari-Barmer section of North Western Railway is at a distance of 12 kilometers from this temple. Bus service, and private vehicles from every tirth in Rajasthan to this place are available. In the compound of the temple there is a Dharamshala (disambiguation) (rest-house) with excellent lodging facilities. The other important town nearby is Jasol at distance of 5 km. There are regular buses from Jalore, Bhinmal, Sirohi, Jodhpur, Balotra, Barmer, Udaipur and Jaisalmer to Nakoda. Nearest airports: Jodhpur: 110 km. Shree Pavapuri Tirth Dham: 180 km.